Germany’s public broadcaster has advised nationals that they needn’t be concerned about Islamic terrorism as people are more likely to die choking on their food. In a segment for news service Tagesschau, presenter Charlotte Gnändiger asks whether Germans’ rising fear of terrorism is justified. The journalist tells viewers that anxiety over terror attacks is overblown, and a result of news reports and social media. Standing beside a graph of terror attacks in Western Europe over the decades, Ms. Gnändiger says terrorism is not new to Western Europe and that the 1970s and 80s were “far worse for the number of terror deaths”. However, the European Union (EU) has seen more terror attacks on its soil since January 2015 than the whole decade to 2010. With the exception of two incidents, all terrorist acts within the EU since 2010 have been committed by Islamists. Ms. Gnändiger notes that terrorism in Europe used to be “a more regional issue”, with groups like Germany’s left wing Red Army Faction and Basque separatists in Spain. These, she says, targeted mostly the government and specific people whereas “today’s Islamist terror is aiming at the whole free Western way of life”. 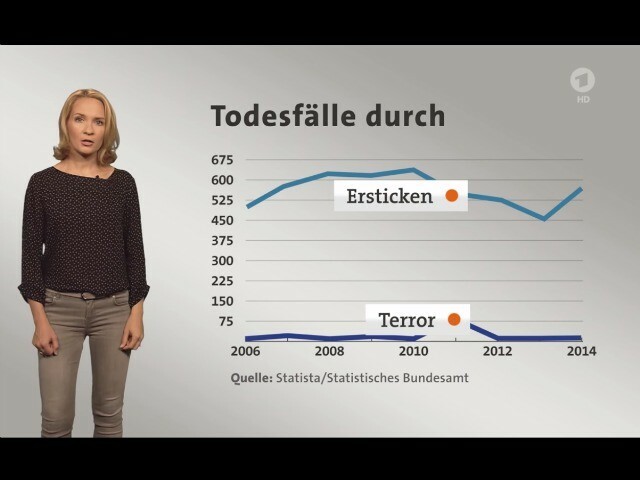 The segment then features another graph, which displays Germans’ fear of terror attacks over time. 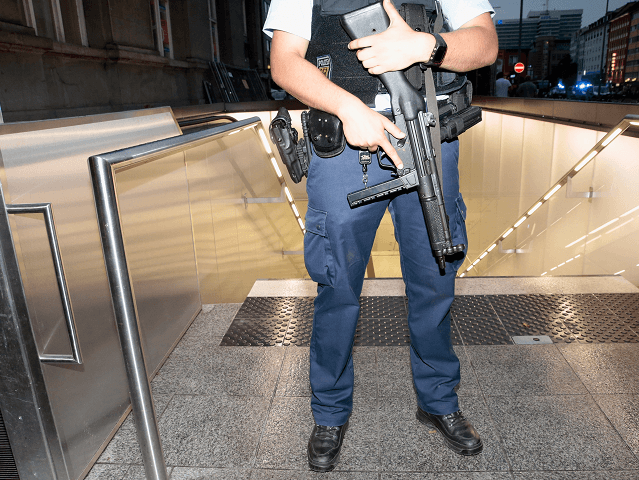 It shows that the percentage of people worried about terrorism striking Germany rose following the Charlie Hebdo shootings in Paris, the November 2015 Paris attacks and the Brussels bombings. Speaking of how 68 per cent of Germans now fear terrorist attacks on German soil, Ms. Gnändiger attributes people’s worries to the attackers’ unpredictability and their targeting of civilians. She adds that most fear of terrorism, however, is down to “pictures in the media”. The journalist advises that “experts say to not over-burden oneself with horrible images, and people sharing them on social media may increase anxiety about the issue. Ms. Gnändiger states that it’s a “victory” for terrorists, if people are afraid, so Germans should “combat fear” by bearing in mind that their chance of dying in a terrorist attack is low. To illustrate this point, the presenter says: “In Germany, for example, you’re much more likely to die choking on your own food.” Accompanying this assertion is a graph which compares the number of deaths from terror attacks to the number who choke to death each year in Germany. Part of its “In a Nutshell” series, the segment was aired on Tagesschau, a German television news service produced on behalf of German public service broadcaster ARD. Tagesschau has attracted criticism for promoting a similar editorial line to the views of the government. Ms. Gnändiger’s warnings about fear and media coverage of terrorism tie in with advice given by the Media Diversity Institute (MDI). An influential media watchdog, research, and training institute, the MDI recommends media bodies be careful when reporting terrorism so as not to cause alarm. The MDI urges broadcasters not to use “shocking” testimony or images of terror attacks and cautions against reporting on them in a way that makes people angry as it could lead to “generalisations” about Muslims on social media. Funded by the UK government and George Soros, the body works to “encourage and facilitate responsible media coverage of diversity”.